Is John Bolton the Man Who Will Dismantle the Islamic & Marxist Counter-States in America? How can an American citizen know Ambassador John Bolton, President Trump’s new National Security Advisor, is a good choice for the position? Because the Marxists are losing their minds. In fact, John Bolton brings to the table an understanding of a wide variety of threats with strategies to take the fight to the enemy. UTT’s President John Guandolo interviewed colleagues Philip Haney and Trevor Loudon to weigh in on this issue while the three men spoke together at a panel discussion this past weekend at the Western Conservative Summit in Phoenix, Arizona. The topic was the Islamic and Marxist Threats. One of America’s greatest resources for information on the Marxist penetration of our government and society is New Zealand native Trevor Loudon. His movie The Enemies Within tells the tale of the devastating penetration of the American government by avowed Marxists as well as jihadists. Not only is McMaster thankfully gone, but replacing him with Bolton is the best news I’ve heard in a very long time. Finally, the “Unholy Alliance” has someone to fear…other than President Trump. Bolton appears to be an excellent choice. It remains a bit of a mystery why he was passed over at the beginning of President Trump’s term, but the President seems to know when to bring in fresh blood and fresh minds to keep the MAGA agenda moving forward. The most formidable array of demonstrably seditious obstructionists any dedicated American nationalist like John Bolton would perforce have to face as National Security Advisor, is currently comprised of an undefined number of megalomaniacal “wink & nod” federally embedded impostors masquerading as U.S. District Court judges who, in any nautical context linked to immigration, appear to be feverishly embarked on a collusive attempt to run the so-called “Ship of State” either aground on the nearest reef or bow-on into a Titanic sized iceberg. On the other hand, given the fact that the country is involved in an existential war* of survival and under literal siege by an ever burgeoning horde of sharia-adherent Muslims who have effectively wormed their way into a comprehensive grouping of federal & domestic law enforcement entities et al in order to either control us or kill us, all one need do to assess the efficacy of the salvational benefit of having the likes of a John Bolton at the helm of the NSA is to juxtapose the “John Bolton” & “Nationalism” Wikipedia pages and start reading. The president has made a superb choice! *Anyone wishing to acquaint themselves with the chilling details of Islam’s declaration of war on the United States, which was seized by Special Agents of the FBI from a subterranean basement in Annandale, Virginia in compliance with a federal search warrant in 2004, may request an Arabic-to-English verbatim translation of the actual document (for a nominal handling & postage fee) by contacting: http://www.securefreedom.org, to order: GOVERNMENT EXHIBIT 003-0085 3:O4-CR-240-G U.S. v. HLF, et al. Thank you for this positive column. Encouraging beyond count that a wise knowledgeable statesmen is now in charge of our national security. I too have a bit more sense of calm to see that President Trump clearly saw John Bolton and recognized Mr. Bolton as someone that has good “analytical knowledge” needed in national security. When the deceptive enemy gets upset, about words used or documents, you know he is the right man. I have already noticed a slight change in the news reporting. 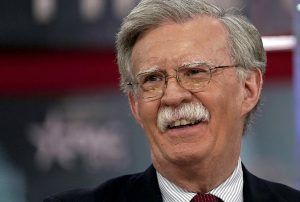 There is one thing about Mr. Bolton that we must monitor and that is the fact that he could be labeled a “war monger”. He has given his opinion that we should go to war all too often. Our wars since Korea have all been “police actions” that have enriched the bank accounts of the military-industrial complex and ended the lives of hundreds of thousands of young men in the military without winning those wars. I know- I am a Vietnam veteran!!! My comment will not make you happy, but I’ll say it anyway. The Marxists and all types of lefties hate the Bush family, Paul Ryan, Mitch McConnell, John McCain, Romney, among other deep state operatives because they are Republicans/conservatives, or so it seems. The left is unaware these traitors are on their side as is Bolton. John Bolton is a member of the Globalist NWO Neocon Council on Foreign Relations. All members are working on implementing the no borders one world government. Bolton masquerades as a conservative, although he doesn’t do a good job of hiding his Neocon endless war promotion plus I have never heard him say a negative word about the Globalist’s administrative branch, the U.N. when the conversation touched that subject. Trump will figure this out as he did with McMaster. G’day all. Now we have the Big 3 in the White House in President Trump, Secretary of State Mike Pompeo and National Security Advisor John Bolton! I want to see the smug nihad awad on trial after cair is designated a terrorist organization, handcuffed and sentenced for treason. Then we will see who’s miserable house has fallen!! God Bless America and MAGA!! !